ERP v MES Guide: Which Do I Need? Manufacturing is entering a new era of automation where digital systems play an ever-increasing role. As higher customer expectations drive the demand for accelerated turnaround times and tighter economies require less costly errors on the line, companies are under increasing pressure to automate workflows to gain a competitive edge. 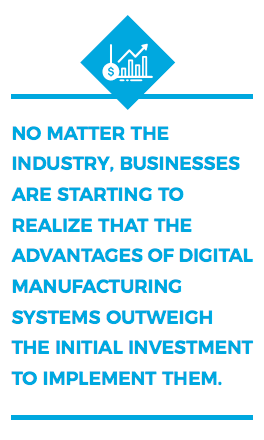 No matter the industry, businesses are starting to realize that the advantages of digital manufacturing systems outweigh the initial investment to implement them. Benefits include windfalls from eliminating time-wasting inefficiencies that occur due to slow reaction to unforeseen events and the ability to automatically track and record each segment and ingredient of every process (a huge help especially to heavily regulated industries). As digitization has taken root in manufacturing over the last few decades, two particular types of systems that overlap in functionality but maintain distinct purposes have garnered attention and debate: Enterprise Resource Planning (ERP) and the Manufacturing Execution System (MES). Exploring the core functions of each of these applications can help decision makers determine whether one of these systems or the other, or both working together, will better equip the organization to accomplish its manufacturing objectives. ERP has expanded into such a universal concept in the business world that some seem to view it as a panacea for all organizational and production problems. In reality, ERP focuses specifically on planning the use of resources. The different departments of an organization feed data into the ERP system, and it provides a cross-platform ability to enable every area within the business to share information. Designers build ERP systems around transactional processes inherent to the particular type of business. In a manufacturing setting, the focus of an ERP platform is on providing timely knowledge about the availability of assets to meet deadlines. The system generates reports on topics such as how much material the process has used, how much is still available and when an order for more raw material needs to take place in order to receive delivery in time to continue production on schedule. ERP applications distribute information in snapshots from each area of the company to all others to eliminate isolated pockets of data that could result in unexpected slowdowns. Modern ERP systems are adept at increasing transparency and efficiency within an organization and pinpointing problems so management can address them in future strategic planning sessions. As the name suggests, the designers of Manufacturing Execution Systems are primarily involved in the "how" component of making things. MES evolved from the Manufacturing Resource Planning (MRP) software systems of the past and expanded on their functionality to read, interpret and react to data from process control systems. An MES acts as an operative layer between the machine manufacturing process and the human decision makers on the shop floor. Labor shortages, delivery problems, mechanical failures and machine malperformance all represent variable factors that have derailed production schedules in the past. Modern MES applications provide information in real-time to enable rapid adjustments to unforeseen changes in the process. A properly implemented MES system monitors events such as these on the line and makes the necessary corrections to limit losses and slowdowns. A fully integrated MES also provides a level of OEE (Overall Equipment Effectiveness) reporting which allows a company executive, supervisor or operators to dive deep into shop floor performance to pinpoint inefficiencies and improve yields. The MES system accounts for material quantities, work rates, process efficiencies and other similar factors. It makes adjustments in the scheduling of workers, deliveries, job batches and related areas to eliminate or minimize any wastefulness present in the process. The MES accomplishes this feat using feedback loops to monitor physical processes continuously, capture data and evaluate it. The program then feeds the results back into the system to adjust the processes as required to keep everything running smoothly. 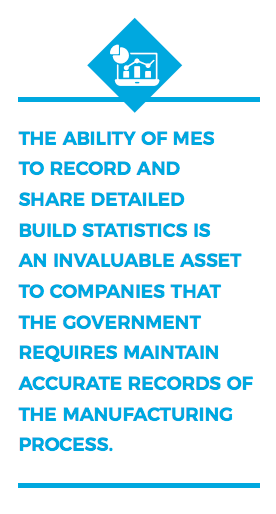 The ability of MES to record and share detailed build statistics is an invaluable asset to companies that the government requires maintain accurate records of the manufacturing process. How Are an ERP and MES Different? The fact that ERP and MES are both reporting systems leads to some confusion about which one, or in what combination, a given manufacturing operation may necessitate. Some businesses involved in production have been able to replace all or part of MES systems with components of ERP with some success. However, doing so amounts to stretching the use of the ERP beyond the intent of its purpose. A well-designed and implemented ERP system, with its means of data acquisition and transaction-based sharing of data, functions superbly as a pathway of information between nodes within an organization to assist management with guidance and engagement. On the other hand, MES capabilities and attributes focus specifically on the realities of the production floor. By providing a link between the physical process sensors and decisions directly affecting events within the manufacturing process, MES provides an ideally suited means to solve problems of the job at hand quickly, before it is too late to salvage any profit, or even the job itself. Thus, the real-time characteristic of MES makes it apt for performing the rapid refinements needed to squeeze maximum profit from the tight margins of the typical production scenario. Traceability of Integrated Supply Chains – In industries that the government heavily regulates, such as medical device manufacturing, tracking changes to the source of all materials in a manufacturing process is critical. Frequently, the same parts or subassemblies from multiple suppliers fluidly enter and exit the assembly line based on schedules, costs and availability. The means to maintain detailed and provably accurate product genealogy is vital and resides in the core functionality of MES. Dormancy of Information Flow – Increased automation on the line maximizes the importance of accurate data at every stage. Without the built-in functionality of MES to incorporate sensor readings into the data flow, production facility personnel must manually enter data on spreadsheets or paper records for subsequent processing by the ERP. Human involvement at this phase naturally leads to errors in data entry and eliminates the real-time information access provided by an MES system that enables quick reactions to frequently changing variables. Manufacturing Specific Features – Issues that arise during the manufacturing process often require immediate action to reduce disruptions or losses. The real-time monitoring of variables enables MES to prevent or at least mitigate most problems as or before they occur. Designers program algorithms for possible contingencies for situations specific to the manufacturing environment. For example, if a heating element starts to fail, the system can report the problem and schedule maintenance before a process aborts due to an ingredient exceeding or falling below the required temperature parameters for the job. The government imposes strict regulations on all of these sectors in an attempt to guard public safety. Each one represents an industry that requires not only the ability to produce in extremely high volumes but also must be able to trace production back to the individual part or ingredient level to determine fault in cases of endangered health or wellbeing. Since manufacturing businesses must also maintain departments that control the managerial, accounting, sales, marketing and clerical duties in addition to accomplishing the ardent job of efficient production, they usually pursue a hybrid solution to align the organization fully. Typically, for optimal functionality, the MES works as a vital cog within an overarching ERP system. This type of cooperative arrangement allows each system to do what its designers intended. The ERP gathers and shares information across the enterprise to inform decisions, while the MES manages the specific and minute details of the organization’s production arm. Determining how to configure a workable system usually requires the company to perform an in-depth Strengths, Weaknesses, Opportunities and Threats (SWOT) analysis to determine which system or combination of systems will best serve its needs. By carefully examining on a granular level the positive and negative factors, both external and internal, companies face, analysts are better able to tailor digital control systems to capitalize on available assets and mitigate any challenges. In what experts are calling Industry 4.0, automation, seamless communication across platforms and remote access continue to define the future of both ERP and MES systems. Utilizing the power of cloud technology enables manufacturing systems of all types to enjoy better scalability across global assets while providing data transparency and tight control over all facets of production. As long as engineers continue conceiving smarter and more precise sensors and developers keep building better data bridges between systems and people, manufacturers stand to benefit through an increased scope, efficiency and, ultimately, greater profitability. A blurring of the lines between ERP and MES is understandable to some extent due to the continual and rapid evolution of technology on all fronts. However, since the dedicated roles of each of these systems are unique and separate, identifying a software solution that best suits a particular company’s operational needs is vital to its success in the modern manufacturing landscape..
Intraratio provides intelligent MES and yield management systems to manufacturing customers. They have a proven record of achieving increased profitability and elimination of waste for manufacturing companies. 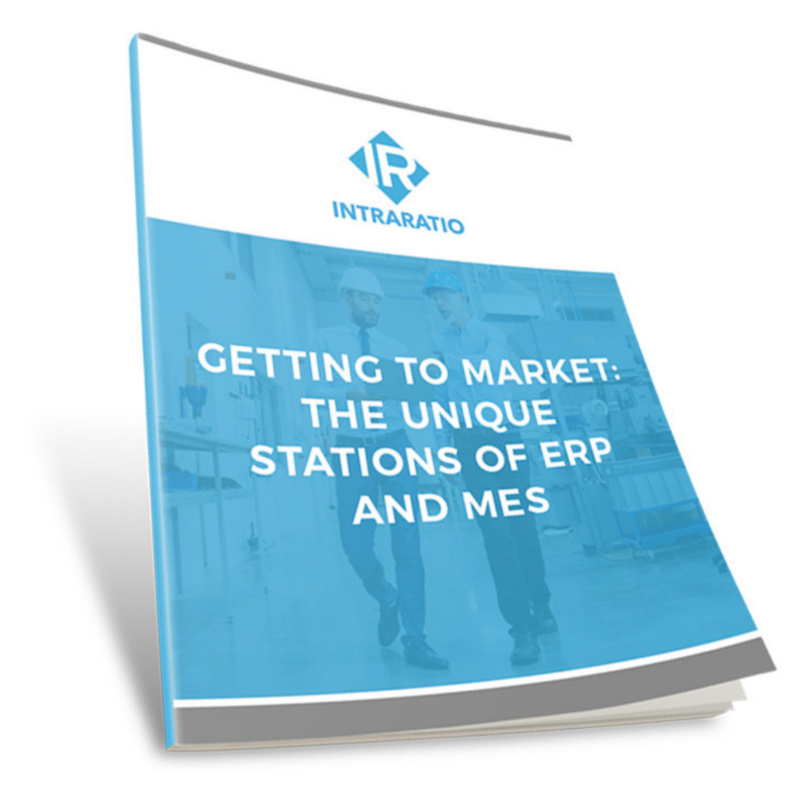 Book time now with an MES expert from Intraratio to discuss a custom solution to solve your manufacturing challenges. Download this page as a helpful guidebook PDF! Questions? CONTACT US with any inquiries. Happy to help.